Aizawl: Voting is underway in 40 assembly constituencies of Mizoram with a turnout of 29% till 11 am. Mizoram, the last northeast bastion of Congress, saw a voter turnout of 81% last polls in November 2013, when Congress came to power. The voting began at 7 am amid tight security and will continue till 4 pm. Around 40 companies of Central Armed Police Forces, in addition to the state police, have been deployed at 1,179 polling stations to ensure free and fair polls. A total of 7,70,395 voters, including 3,94,897 women will decide the fate of 209 contesting candidates. Mizoram is the only state where women electors outnumber men. Of the total 7.68 lakh voters, as many as 3.93 lakh are women and 3.74 lakh are men. Congress, Bharatiya Janata Party (BJP) and Mizo National Front (MNF) are the three major parties pitted against each other to win the Mizoram battle. The Congress and the MNF have fielded 40 candidates each, while the BJP is contesting in 39 seats. The Zoram Peoples Movement (ZPM), an alliance formed by two political parties and four groups, is contesting in 35 seats. Mizoram has been under Congress’ rule for a decade under the leadership of Chief Minister Lal Thanhawala. This year, the party is set to contest from all 40 seats in the upcoming polls. Chief Minister Lal Thanhawla is contesting the election from two seats (Serchhip and Champhai South). Thanhawla is a five-time chief minister. In addition to dynastic politics, there are issues of anti-incumbency, unrest within the party, exit of key members that the Congress is facing. The BJP has a perception war to win. Authorities have arranged transportation facilities to over 11,000 Bru people living in Tripura to travel Mizoram to cast their votes. Around 15 temporary polling stations have been set up at Kanhmun village in Mamit district. 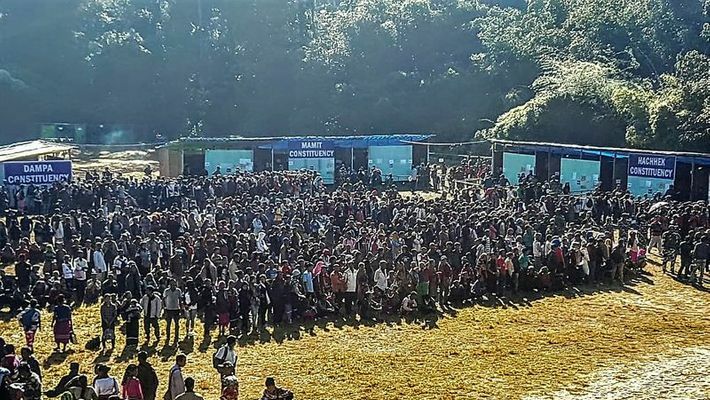 Mizoram Chief Electoral Officer Ashish Kundra said all 15 temporary polling stations have been set up at Kanhmun village along Tripura-Mizoram border. Bru people have been provided with transport facility to travel to Mizoram to vote. Bru voters had cast their votes in the temporary polling stations. “All facilities have been provided to the Bru refugee voters in the polling stations,” Kundra said. To encourage women voters to come and vote, pink polling stations were set up, which were managed by women officials. These booths had one presiding officer, three polling officials, and security personnel. Similar booths were set up in states like Goa and Punjab. In Mizoram, women electors outnumber men. The state saw a spike in the number of female electors in 2013 and 2014. This year too, women electors outnumber males. The ratio is 1,051 female per 1,000 male voters in 2018. In 2013 and 2014, the ratio was 1,029 and 1,036, respectively, per 1,000 males.